In 1892 the brilliant Swiss engineer Otto Steiger from St. Gallen (1858-1923), who lived in Munich, received his first patent for a calculating machine of direct multiplication type (German patent DE 72870). Next years the machine was patented in Switzerland, Great Britain, France, USA and Canada. The machine of Otto Steiger is the fourth designed (after the machines of Barbour, Verea and Bollée), but first commercially-successful direct multiplication calculating machine, which was in production until 1935 and despite his extremely high price (e.g. in the USA in the beginning of 20-th century machine was sold from $475 all the way up to $1100, at the same time this was the price of a normal car) had a commercial success. In his German patent of 1892 Steiger describes a machine which uses a mechanical representation of the multiplication table to form partial products, in the same way that a human "calculator" uses a multiplication table committed to memory. The partial products are then transferred via a "transmitting mechanism" to a "combining and registering mechanism" for display to the operator. The Steiger's machine is to be regarded as a proper multiplication machine in that it solves problems of multiplication directly on the basis of the multiplication table, whereas other types of calculating machines are only adding machines and, as such, carry out multiplication by a continued series of additions. The main advantage of the Steiger's calculating machine (and of all other direct multiplication machines), as against all other types of calculating machines, is the astounding speed with which it operates, especially while doing multiplication and division. Each place of the multiplier or quotient requires only a single turn of the crank, during which the necessary displacement of the result occurs automatically. For example, a trained operator was able to multiply two 8-digital numbers in about 7 seconds, incredible speed for this time. The Steiger's machine could not be surpassed for rapid and reliable multiplication until the fully-automatic rotary calculators became available in the mid to late 1930s. Steiger's design was taken up by his fiend—the engineer Hans W. Egli (1862–1923) from Zurich (see the nearby photo), who made numerous changes and improvements as he developed the machine for production. The machine was produced by his company H. W. Egli, A. G., Zurich, beginning in 1895, under the name Millionaire (Millionär in German). By the early 1900s, 2000 machines were in use, and the last of 4655 Millionaires was sold in 1935. The American agent for the Millionaire was William Morschhauser of New York. Advertising from 1913 claims that the United States government had purchased over 100 Millionaire calculators. Although the Millionaire was developed for business calculations, scientists also found it very useful, and government agencies became the prime customers. 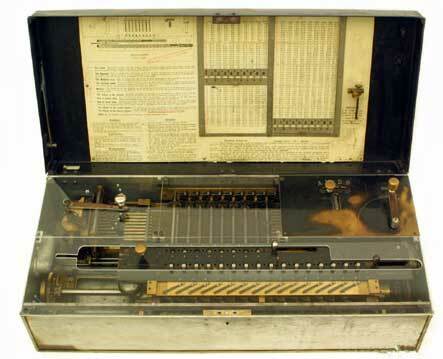 Calculating machine is built into a case (wooden or metal) with hinged lid, size 67 cm wide, 32 cm deep, 19 cm high. The case has metal carry handles on each end and a metal lock at the front. The machine is made up of various metal components. Adhered inside the lid is a chart printed on paper in black and red containing instructions and a dividing schedule. Also attached to the inside of the lid is a brass safety screw and a cleaning brush made of bristles with a black painted wooden handle. The machine is too heavy, about 35 kg. Although excelling in multiplication and division calculations, the Millionaire's slider setting mechanism was too slow to be useful in adding long columns of figures. 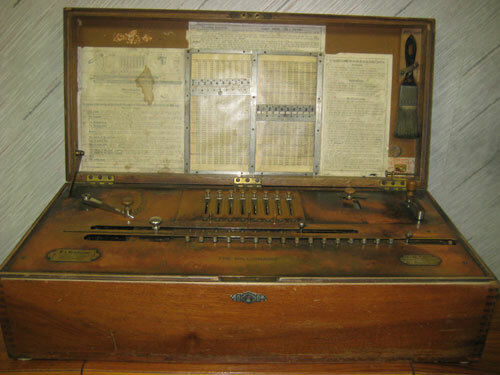 The provision of an optional keyboard (1913) instead of sliders (see the photo below) and an electric motor drive (1911) made the machine equally practical for all types of calculations. The motor-driven machine was supplied on a tubular metal stand with the motor and gearbox mounted underneath. The wooden case was replaced with aluminium side panels and a painted sheet-metal cover. 1. Eight input sliders, (marked with e in the drawing). Actually the machine was manufactured in four variants, as regards to digital positions—6x6x12, 6 input positions (sliders), 6 positions in the counter, 12 positions in the accumulator (result mechanism), 8x8x16, 12x8x20, 10x10x20. There are also variants with 6 and 10 sliders. These sliders are used for setting of the first factor. Below the sliders is included a row of check dials (marked with b) to give a straight-line display of the setting. 2. Multiplier control lever (marked with H, which sets the second factor, one digit at a time, starting with the most significant). 4. Operating crank (K). The crank is given one full turn clockwise for each machine cycle, until it comes to rest against a fixed stop in its home position. The crank must never be turned backwards. 1. 8-digit counter (windows, marked with c). 2. 16-digit accumulator register (marked with R). The knobs to the right of each register (marked with k1 and k2) are pulled to the right to clear the display. The Millionaire is primarily a multiplying machine, not an adding machine, and is best described and understood from this perspective. When we multiply (say) 7 by 6, the result is comprised of four tens and two units. The multiplication table that we have stored in our memory retrieves the answer as the single number 42. The Millionaire also contains a multiplication table, but differs in that it processes the tens and units for each digit separately. These "partial products" are combined in an accumulator register to display a single result. When the Millionaire multiplies 7 by 6, its controlling mechanism refers to the internal multiplication table and returns the partial product 4 (tens). This is added to the register, which then moves one place to the left. The multiplication table then returns 2 (units), which is added to the register (now to the right of the tens) to display the answer 42. The machine requires only one turn of the crank for each digit of the multiplier, but makes two partial-product cycles for each turn—one for the tens, then one for the units. The machine is first cleared, the carriage is returned to the right-hand side, and the Regulator is set to M (for multiplication). The first factor (the multiplicand) is set on the sliders or keyboard. The multiplier lever is set to the first (most significant) digit of the second factor and the crank is given one full turn clockwise. The set-and-turn procedure is repeated for the remaining digits. At the end of the process all three components are visible for verification—the multiplicand in the setting mechanism, the multiplier in the counter register, and the result in the accumulator. To perform an addition on a multiplying machine, the carriage is held stationary, while the entry is multiplied by 1. The partial product is the same as the original entry, which is added to the accumulator. The operator have to clear the machine, return the carriage to the right-hand side, set the Regulator to A, and set the multiplier to 1. Numbers entered on the setting mechanism are added to the accumulator by turning the crank. The carriage does not move, and the counter mechanism does not operate. Internally, setting the Regulator to A disconnects the carriage shift driving dog so that the carriage will remain stationary. With the multiplier set to 1, there will be no movement of the racks on the tens cycle. On the units cycle, the value in the setting mechanism will be multiplied by 1 and added to the accumulator. The motor-driven machine has a lever (at the rear of the multiplier panel) which locks the multiplier lever at 1 and engages the automatic keyboard clearing mechanism at the end of each cycle. Subtraction is the same as addition, except that the differentials drive the register in the opposite direction. If the initial value for a subtraction is not already present in the accumulator (as a result of a previous calculation), it can be entered manually using the twirler knobs. Division is performed by the usual method of repeated subtraction, but with the advantage that multiple subtractions can be performed in a single operation. The carriage is first cleared and returned to the right, and the Regulator is set to D. The dividend is set in the accumulator using the twirlers, starting one place in from the left-hand end (to allow for the automatic carriage shift). The divisor is set at the left-hand side of the sliders or keyboard. The operator estimates the number of times the divisor can be subtracted from the dividend by comparing the initial digits of each, then sets the multiplier lever to the estimate and turns the crank. At the completion of the cycle, the number set on the multiplier lever appears in the counter as the first digit of the quotient, the product of the quotient digit and the divisor has been subtracted from the accumulator, and the carriage has been moved one place to the left. The process is repeated until sufficient digits have been obtained. The efficiency of division on the Millionaire depends on the skill of the operator in estimating the quotient digits, as much time can be lost in correcting a poor estimate. If the estimate is too high, an overdraft will occur and the bell will ring. In order to cancel the excess subtraction, the operator have to change the Regulator to Addition, set the multiplier to 1, turn the crank until the overdraft is cleared, then change the Regulator back to Division and continue on. If the estimate is too low, there is no warning bell. In preparing the next estimate, the operator must be alert to observe that the divisor is greater than the dividend, and then follow a similar process to perform an extra subtraction. As an aid to less skilled operators, a chart of 1-to-9 times 1-to-99 is fastened inside the lid of the machine, with a pair of sliding metal cursors and a set of instructions for a purely mechanical method of estimation. It is still possible for occasional errors to be made due to differences in the third places. Lets examine the most important parts of the internal mechanism of the machine. This view shows the general arrangement of the machine with the keyboard and carriage removed. The racks are mounted left-to-right at the centre rear of the machine, with the cross shafts at right angles above them. There are ten racks, and one cross-shaft for each slider or keyboard column. The carriage register travels right-to-left above the differentials near the centre of the machine. The multiplier body and its controlling mechanisms are mounted along the left-hand side, with the main drive mechanism at the right. The camshaft across the front controls the sequencing of the machine operations, according to the setting of the Regulator. There are ten sliding racks mounted horizontally at the rear of the machine. 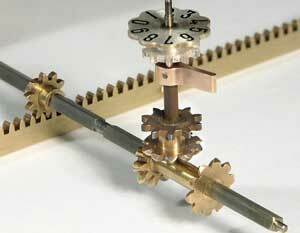 The movement of the racks is picked up by a pinion on a cross-shaft, and is transferred through the bevel gears to the register dial in the carriage. The cross-shafts correspond to the columns of the setting mechanism. The racks correspond to the numbers set on the sliders (or keyboard). The distance moved by each rack is the product of the rack number and the setting of the multiplier lever, as determined by the multiplication table for the tens and units separately. For example, setting a slider to 7 will engage its pinion with rack number 7. Setting the multiplier lever to 6 will cause rack 7 to move 4 places during the tens cycle, and 2 places during the units. (All of the other racks will also move according to the six-times table, regardless of whether they are needed or not). Reversing the movement for subtraction is done by sliding the double "differential" gear along the cross shaft to drive the register's bevel gear from its opposite side. The differential gear moves to a central or neutral position to disengage the register while the racks are being returned to their home position. The multiplier mechanism controls the movements of the racks in accordance with the multiplication table and the setting of the multiplier lever. The multiplication table contains the products of single digits up to 9 x 9. It is divided into two halves to handle the tens and units of the results separately. The values in each table are represented mechanically in a multiplier body by pins or steps of varying length. In operation, the multiplier body is positioned vertically and horizontally to bring the appropriate rows and columns into alignment with the left-hand ends of the racks. It is then pulled to the right by the drive mechanism, moving the racks according to the lengths of the selected pins. 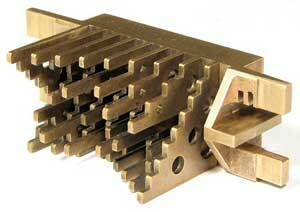 The base of the multiplier body is a block of brass measuring. Nine pairs of stepped plates are set vertically into the block to supply the tens and units values for each of the nine racks. The tens and units plates are arranged alternately, so that each set is on centres to align with the ends of the racks. Either set can be selected by sliding the block sideways. The inactive plates align with the spaces between the racks. The plates are divided into 9 horizontal rows, corresponding to values 1 to 9 of the multiplier. The multiplier lever lifts the selected row into alignment with the ends of the racks. The length of the plate or pin at each grid position is the product of the rack number and the row number, for the tens and units separately. Each lengthwise step is 4mm, corresponding to a rack movement of exactly one tooth. The slider mechanism is built on a brass panel. The sliders are 20mm apart, and move through 9 steps of 7.5mm (the same as the cross-shaft and rack spacings). The sliders are held in the set position by flat detent springs which engage with grooves cut into the underside of the plate. The brass selector forks straddle the cross-shaft pinion in two directions, holding the selector arm vertical and allowing the pinion to be moved into engagement with any of the ten racks. The numeral wheels along the front of the plate provide a straight-line readout of the slider setting. Each wheel is driven by a perforated steel band which loops between a toothed pulley at the front and an idler at the rear of the panel. The band is attached to the upper end of the selector arm. The H. W. Egli company went on to develop an automatic division machine (the MADAS) in 1913, and a full-keyboard rotary calculator (the Portable MADAS) in 1931. Design details from Steiger's original patents can still be seen in the MADAS calculators of the 1960s.